Provides more uniform and smooth skin. 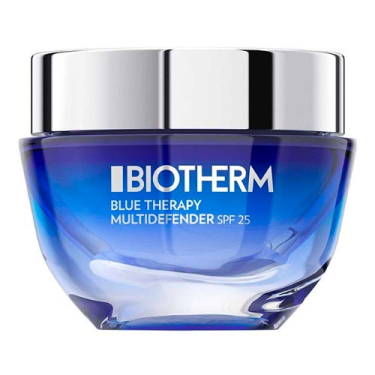 Blue Therapy Multi-Defender SPF25 Normal Skin from Biotherm is the 1st anti-aging cream to protect against UVB, UVA and pollution. Most of the aging signs are due to exposure to the outdoors. Currently, daily protection creams only protect 25% of them. 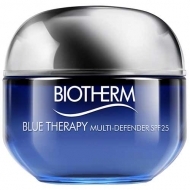 Now Biotherm creates a unique symbiosis of unprecedented protection and visible repair to give you the most complete shield against all aging accelerators. A new generation of anti-aging infused with the 1st Broad Outdoor Defense Complex, to defend the skin like never before. Apply daily, for best results, on clean face and neck; Using both hands, put on the face in a pattern out from the center; Finish by the neck; Avoid the eye area.